Feature request: Rethink the submit button functionality for multiple uploads. I'm sure I've read another thread regarding this issue but I wasn't able to find it and I have yet to hear of any type of solution for it. The issue is that on a multiple upload form, the user must wait until the uploads are complete prior to hitting the submit button. If they hit the submit button without the uploads being complete, the form confirms a successful post despite the fact that the uploads were never finished. This just doesn't seem to make any operational sense when you compare the way most upload forms work on other sites. I think most people are used to selecting their files, hitting submit and then seeing a progress bar of their upload with a confirmation after a successful upload and submitall is completed. I understand that the single-upload button works this way but you have a number of paying customers with the need for multiple uploads that may be running into the same issue we are having. Despite all the verbiage and the simple step-by-step process we detail on our site to instruct our clients, we continually have people hitting submit without completed uploads. Please help. As far as I can see, submit button is not available during uploading through multiple upload element, at this time. I have checked this in different browsers. If you are still able to reproduce the problem, please let us know. 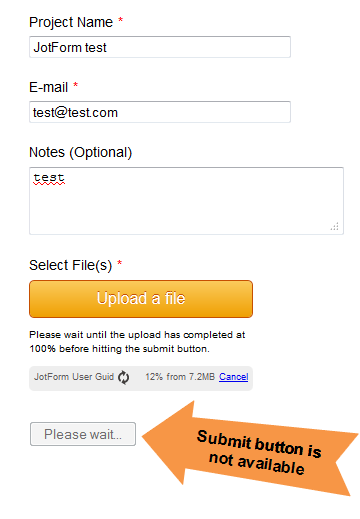 Also please note that we have added a feature request about form autosubmit on upload to our Nice To Do list, and it will be implemented in the future. Please feel free to contact us if you need any other assistance. We will be happy to help you.